Bigfoot News out of Georgia was a hoax ! No surprise: The hoopla over Bigfoot was a hoax. After last week's press conference in which two men explained the story of how they found what they said was Bigfoot, an independent investigator now says it was all a lie. Now the two men are nowhere to be found and are being investigated for fraud. On or around Aug. 14, Biscardi paid an "undisclosed amount" to Whitton and Dyer in exchange for the body and marketing and promotions rights. Kulls notes that the two men told Biscardi they would not release the body to them until after the press conference was over. On Aug. 16, the freezer with the body was turned over to Biscardi and his Searching For Bigfoot team. Kulls began thawing the body and performing the examination, and that's when everything began to crumble. "We burned [a hair sample] and [it] melted into a ball uncharacteristic of hair," Kulls said in his statement. Then he examined the rest of the body. "I was able to feel that [the head] seemed mostly firm, but unusually hollow in one small section. This was yet another ominous sign." "Within the next hour of thaw, a break appeared up near the feet area. As the team and I began examining this area near the feet, I observed the foot which looked unnatural, reached in and confirmed it was a rubber foot." After finding out they were the victims of a hoax, Biscardi and his team contacted Whitton and Dyer who allegedly admitted it was a costume. They agreed to sign a promissory note and meet at the hotel where they were staying. But when Biscardi's team showed up, they were gone. 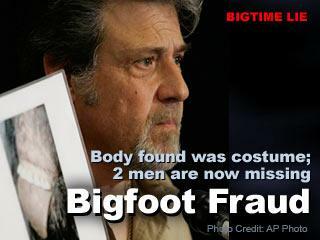 "At this time action is being instigated against the perpetrators of this fraud," Kulls wrote on SearchingForBigFoot.com. "On behalf of myself I can say with certainty Matthew Whitton and Ricky Dyer [are] not the best Bigfoot trackers in the world!"